Call it Bobozi, Abacha Mmiri, Air Condition or for the ajebutters, Wet Cassava Chips. 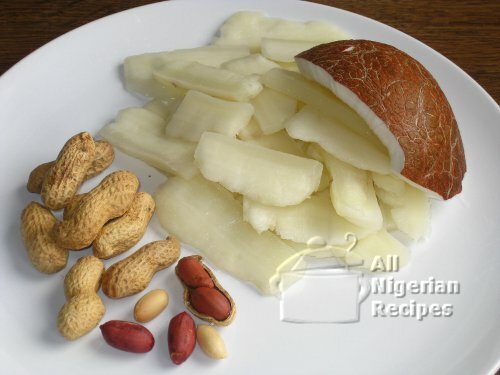 This is the Nigerian Snack you want to eat on that hot sunny day. The nickname Air Condition comes from the way it cools the body when you eat it on a hot day. Cassava tubers (Yuca): as much as you can eat. Peel and wash the cassava tubers. Cut them up into 2 inch long cylindrical pieces or shorter depending on how long you want your Bobozee. Put the pieces in a pot, pour cold water to cover the contents and cook till they are hard done. Take them out of the water and spread out to cool down completely. Slice them up along the pieces of cassava. The slices should be about 3mm thin. Soak overnight in plenty of cold water. The next day, rinse several times in a generous quantity of cold water by gently rubbing on the chips with your open palms. Rinse till they are no longer slimy and the sour taste is gone. Change the water often as you rinse them. Note: Some species of cassava are not so slimy, for those; rinse till the sweet and sour taste is gone. Eat with coconuts, palm kernel or my favourite: roasted groundnuts (peanuts).